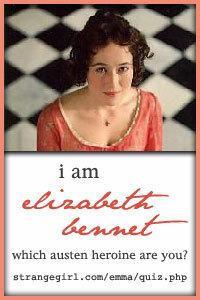 Click on this Fully Booked blog entry for more details, and answers to any of your queries. Are you a DC fan? Click here for some comics that might be available to you come Free Comic Book Day. If you’re a kid, teen, or just young-at-heart, click here for some comic books that might just fit your fancy. For food lovers, cooking enthusiasts, and adventure seekers, join Yummy Magazine’s event and get to meet chefs and fellow foodies who will be able to share with you guys some tips and secrets for your next dish or a great recommendation for your next dinner date. Unlike previous years when a minimal admission fee was charged, this year’s festival will experiment with free admission. Schools are welcome to bring their students for block screenings on a first-come, first-serve basis. These are the movies that will be presented for this year’s Spring Film Festival.. Ocean Heaven is a family drama which features a father- Sam Wang (played by Jet Li), who is solely taking care of his autistic child- Dafu. Wang finds out that he has liver cancer and has a few days to live. Not only does Wang have to cope with his own suffering and impending death, he also has to deal with the heartache of leaving Dafu with no immediate family. This heartwarming film shows the challenges of being a single parent and how parents, even on their last days, would do anything just to ensure the safety and happiness of their children. Fans of Jet Li will definitely be surprised to see him in this movie because this is the first to cast Li in a non-kung-fu film where he won the 2010 Wen Zhang Best Actor Award. The movie was also recognized by the Shanghai Media Awards, CCTV Movie Channel Media Awards 2010 and Golden Goblet Award. In July 2011, Li even named one of his charity projects as Ocean Heaven Project to help children with autism, cerebral palsy and other disorders. Lost on Journey is a comedy film narrating Li Chenggong’s travel as he endures bad luck after bad luck just to celebrate New Year’s Eve with his family. Li hops from a plane, to a train,to a bus, and to a boat in the desire to be with his family during the most important event of the year. And along the way, he meets a stranger Niu Geng who later helps him discover something important about himself and the goodness of other people. This movie is a funny presentation of how bad luck brought two different worlds together. Country Wedding tells a story of a couple who is about to get married with their families getting so excited to the point that their parents started to meddle with the wedding plans. The bride’s mother, insists on holding the wedding at a ritzy hotel in Beijing whereas, the groom’s father, being the director of a cooperative in a rural village, feels indebted to the community, wants to share the wedding to the whole village. The couple are getting in between as conflicts arise between the in-laws. This film is a funny portrayal of the clash of cultures between the city and country side. Confucius, known as the “Great Sage”, lived during the time when China’s dynasties were in chaos and engulfed by corruption and greed. He strongly believed that ethics and education will put all things to order. His wisdom was sought by different dynasty leaders but only to be abandoned after he dutifully served his purpose. The world knows so much of his teachings, but little is known of his hardships. This biographical drama shows the sufferings and pain Confucius endured and the principles he fervently kept that became the foundation of China’s ethics, morality and law. Starring Chow Yun-Fat as Confucius, Nominated for Best Actor at the 30th Hong Kong Film Awards. Other nominations include Best Cinematography,Art Design,Costume Design and Original Song. In 1905, Hong Kong was under the British rule and revolution was on the rise. Sun Yat-Sen was set to land in Hong Kong to meet and to unify faction leaders to finally take down the corrupt and crumbling Qing Dynasty. Because of this, Dowager Cixi wanted Sun Yat-Sen assassinated. For the Chinese people who had been clamouring for freedom, they understood that keeping Sun Yat-Sen alive would mean keeping China’s hope to be liberated. Li Yutang, a businessman, gathered a tofu vendor, rickshaw pullers, a beggar and an orphan to serve as bodyguards. These bodyguards displayed their superb fighting skills as they battle it out with the assassins to protect Sun Yat-Sen,whom they haven’t even met. This action-historical movie garnered numerous awards from the 4th Asian Film Awards,29th Hong Kong Film Awards,16th Hong Kong Film Critics Society Awards and 47th Golden Horse Awards. This 3D animated movie focuses on environment protection. It is a story of a white deer, Yoyo, who turned into a lady and made friends with Tzan-the prince of Kingdom of Clouds and Dreams. Tzan was ordered by the minister to search the Labyrinth Mountain to hunt for the Milu Deer to use it as a sacrifice to bring rains in the kingdom. But Tzan discovered the beauty of the Labyrinth Mountain and got closer to Yoyo. Together, they fought sea lizard monsters, fire,soldiers, and the evil Minister to save the wildlife and natural resources of the Labyrinth Mountain. This movie became the highest grossing Chinese Animated film of all time and received the Best Animated Film of the 13th Huabiao Awards. 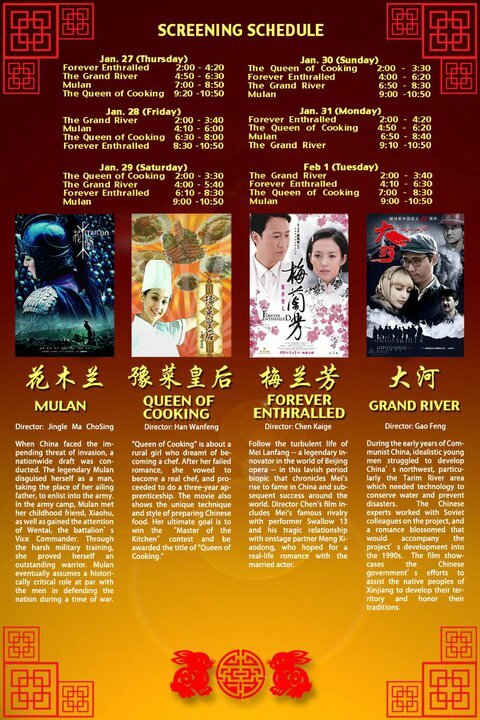 For more information please call Ateneo Ricardo Leong Center for Chinese Studies at (63 2) 426-6001 local 5208-5209; 5280. For tickets, please call Shang Cineplex at (63 2) 633-2227. Broadway’s most refreshing musical comes to Manila in its first ever run! Winner of 4 Tony Awards in 2008 including Best Musical and Best Choreography, In The Heights has definitely captured the hearts of millions around the world with its touching story and great musical beats! In The Heights tells the story of a vibrant community in Manhattan’s Washington Heights – a place where the coffee from the corner bodega is light and sweet and the rhythm of generations of music can be heard everywhere. It’s a neighborhood on the brink of change, armored with dreams and pressures and the biggest challenges are that of deciding which traditions to fulfill and pursue, and which ones to forget and leave behind. EXPERIENCE THE MOST EXCITING MUSICAL TO HIT THE LOCAL BROADWAY SCENE! See you at the opening night of IN THE HEIGHTS! Sponsors of this festival include the Confucius Institute, Credit Suisse Bank, Flexo Manufacturing Corporation, Hyundai Asia Resources Incorporated, Jollibee Foods Corporation, Richwell Trading Corporation, Pfizer, Fortmed Medical Clinics Incorporated, Redpeak Capital Holdings Incorporated and Remal Enterprises Incorporated. For more information, please call Ateneo Leong Center 426-6001 local 5208-5209; 5280. For tickets, please call Shang Cineplex at 633-2227. Re-posting from the Ateneo website. > Get one (1) raffle coupon with every Php3000 single-receipt purchase, cash or credit. Valid for boutique purchases only. > Customer must legibly write his/her full name, complete address, landline and mobile numbers, email address and affix signature on the raffle coupon stub and drop it in designates boxes at all ARROW boutiques nationwide. > Promo runs from August 1 to October 31, 2010. Deadline for submission of entries is on October 31, 2010. > Raffle will be held on November 14, 2010 in the presence of a DTI representative. I’ve always been an avid fan of interior design and architecture. It could be because I have uncles who are engineers and architects, and we really make a living out of designing stuff like houses and buildings. Or maybe, it’s just really me. In fact, on tumblr, I follow a few blogs that showcase different pictures of room layouts and the like, as contributed by people from around the world of course. It fascinates me, all these different themes and designs and ideas. 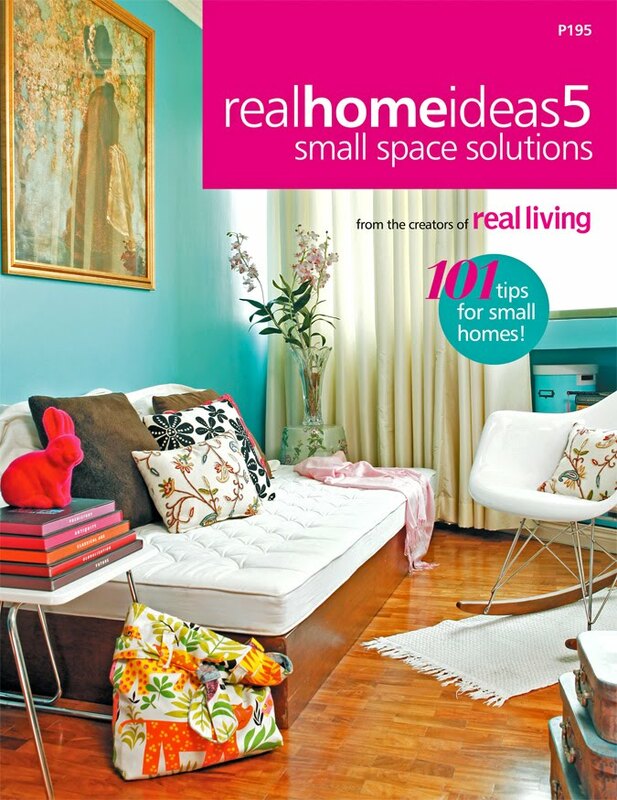 So last June 23, when fellow blogger Fran Haw-Ang invited us to the launching of Real Living magazine’s Real Home Ideas5: Small Space Solutions, I was beyond thrilled. You see, our home is like a mini-dump (to some extent). It’s not messy-messy, but it could be cleaner if you know what I mean. My family, we’re a bunch of pack rats, we find it really difficult to throw away things, which leads to clutter of old things around the house that don’t really get used but take up loads of space. Also, my “moving” to Beijing for my studies means that I’ll live in a dorm or an apartment which is smaller than what I’m used to, so knowing how to layout and organize my belongings will be a big plus. With various themes and ideas in the book, readers can be inspired to re-design their own living spaces, whether or not they live in small or big spaces. During the event, the various interior designers who presented their ideas for various living spaces also answered some questions regarding personal living space issues. Overall, it was definitely a wonderful event. As I browsed through the magazine, I was able to catch sight of some things I might want to look for at SM HomeWorld, since the event was sponsored by SM HomeWorld. I never knew they had such items. Time to consider getting some of those things and replacing some stuff at home. For when I come back from Beijing of course. Who knows how soon or how far away that is.